Some organizations have a very complex Asset tracking system. At the other extreme, some companies choose not to formally track any assets - but they may simply label their assets (everything from Inventory, IT Assets, Tools and Equipment). In either case, a user-friendly device that can print text, and most importantly, barcodes, is a must. Dymo has a number of such solutions. 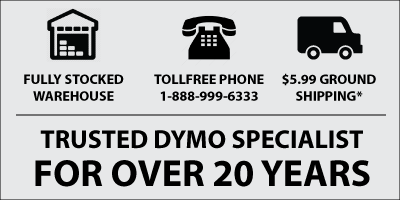 You can use any of the Dymo LabelManager label makers for creating Asset Tracking labels, but in our experience a label maker that prints on at least 3/4" wide label tape is a more suitable option for this purpose. All 3 of these models print on the larger 3/4" wide tape giving you sufficient space for a barcode and text (the 500TS and PnP also print on 1" tape giving more room again). Additionally, all 3 models are PC/Mac connectable so you can actually design the labels on your computer using Dymo's free label software (DLS). The 420P and 500TS enable you to create labels directly on the device which is handy when you want label assets on-the-fly.